That's right. 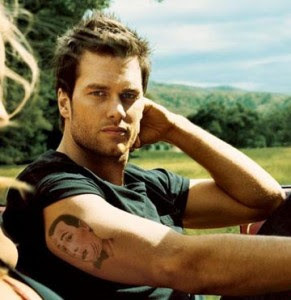 Tom Brady has an issue with YOU! I'm looking right at you. Yup, if you A) drive a red mini-van or if you B) leave a Patriots game early when it's a blow out so you miss the 27 hours of traffic/involuntary parking on Route 1. "...when I looked up, half the stadium was gone when we were up 21 points early fourth quarter, which I wasn't so happy about..."
Oh Tom. You crazy SOB. Ok, so the guy got a little upset about people leaving. No biggie. Home opener, he expected people to stick around. It's not like he said something positive about the Jets in the same breath. "I don't think the Jets fans leave early. They're going to be loud the whole game." Well then. Whether it's the architecture of Gillette Stadium or the fact that people just aren't loud enough for all 48 minutes, Tom is upset. And you know what happens when Tom gets upset? He hits sh*t in his car. I have to go into Boston tomorrow and now I have to worry about Tom whippin' around a corner plowing into my ride. For the record, I was at the game on Sunday and during EVERY SINGLE 3rd down on defense and offense EVERY SINGLE patron within eye sight of me was standing and cheering. Ok, there was a pretty drunk guy behind me that kept yelling at me for standing on every big play, but I think he thought he was standing and was getting upset that I was 18 feet tall and he couldn't see. For another record, I did leave with 6 minutes left in the 4th quarter because I knew the drive home to NH to would be killer enough without the Route 1 traffic making me want to murder everything in sight. So in closing, Tom, chillax brotha man. Keep throwing the passes and let us non-Audi crashing peeps worry about the noise level.